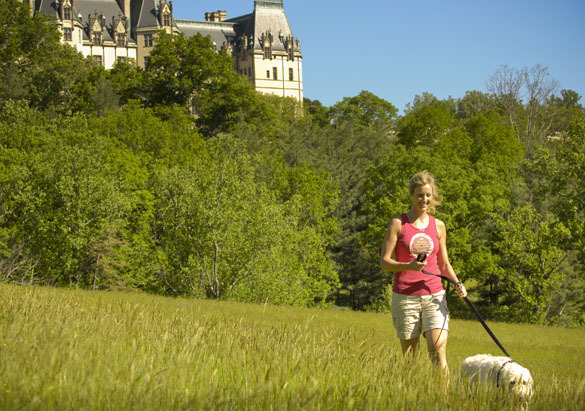 Whether you're at Biltmore for a short stay or are an Annual Passholder, exploring Biltmore's trails is an excellent way to get some outdoor exercise. From leisurely strolls to intense workouts, our trails offer a variety of routes that can be tailored to your skill level, and of course, spectacular views throughout each season. We've listed some of our recommended routes below, and please refer to our Garden Map or Trail Map before you embark. All of the trails listed below are pet-friendly, well-maintained, and offer guests the peace-of-mind that comes with being located on private property. For more infomation, please contact the Outdoor Adventure Center at 828-225-1331. Historic Gardens (walking) - This popular leisurely walking path incorporates the Italian Garden (gravel), Shrub Garden (paved), Walled Garden (paved) and Spring Garden (mulch), stretching about 1-2 miles depending on the particular paths you choose. Enjoy the seasonal blooms with the benefit of several benches along the way to stop, catch your breath, and admire Biltmore's beauty. Please note, some access points to the Shrub Garden and Walled Garden require going up or down railed stairways. Azalea Garden (walking) - This mostly-paved walking path can be accessed from either the Spring Garden or Walled Garden. This lovely path allows guests to go even deeper into Biltmore's historic gardens, offering benches along the way, and leads to Bass Pond Waterfall, Boat House, and spectacular views across the Bass Pond at approximately 1 mile. Lagoon Trail (walking, running, biking) - This mostly flat, paved trail leads to the Lagoon, which offers a striking view of the west side of Biltmore House (a popular picnic spot). Start and end at Antler Hill Village for a pleasant 3-mile trip while the French Broad River and estate farmland provide pleasant scenery. Farm Trail (walking, running, biking) - This this flat gravel and dirt road runs along the permieter of Biltmore's grounds and the French Broad River. Totaling 6 miles, this trail also leads into the Arbor Trace Trail at one end, and the Lagoon Trail at the other. Westover Trails (hiking, biking, trail running) - Access this set of trails from the Bike Barn or The Inn on Biltmore Estate to see some of Biltmore’s beautiful woodland. Loop these The green (1.7 miles) and blue routes (2.8 miles) allow guests to be immersed in nature while offering wide enough trails for a comfortable experience and just a few rolling hills to get your heart pumping. Westover Trails (hiking, trail-running, biking) - The black route totals 3.5 miles round-trip inside Biltmore's beautiful woodland. The narrow trail offers steep hills and is great for a technical single-track bike ride, or authentic hiking experience. Arbor Trace Trail (hiking, trail-running, biking) - This trail can only be accessed by first following the Farm Trail. The 3.5 mile roundtrip route travels in and out of the woods providing scenic views of the estate’s agriculture and the historic Cottage on Biltmore Estate. The last stretch of the trail (black) is quite narrow and an optional loop. Deerpark Trail (walking, running, biking) - This challenging uphill treck is quite popular due to the stunning view of Biltmore's backside it offers. For an even longer challenge, start at Antler Hill Village and take the Farm Trail, to the Lagoon Trail which will meet Deerpark Trail. Is there a map online of all the trails? I am a Pass holder and plan to walk and ride my bike often and would love to know where all the trails are. Hello. We are visiting next month and would like a good view of the bridge on Bass Pond (the one from the film, Last of the Mohicans). Is that easy to get to? On one of my many visits I saw a large black bear in the field when exiting. Any seen while on the walking trails? Are you allowed to go off the trails when Hiking? Hello, we're planning on bringing our own bicycles on a bike rack and doing some exploring after touring the house. Should we leave them on the rack until after touring the house or is there bicycle parking outside the house? (to save us from having to go back to our parked vehicle) thanks! Visiting in mid-Oct, looking for the best birding trails at that time. Does shuttle get to trails and back to lodging? Greetings - we are planning a trip for Labor Day and will be bringing our bikes. Is there a trail that leads close to the house which is accessible by bike? If we want to tour the house while on our bike adventure, is there somewhere to lock them up? The unpaved parking near the azalea garden trail was closed off recently. Will it reopen? What time do the gates open and close for walking? Is there a trail map somewhere?